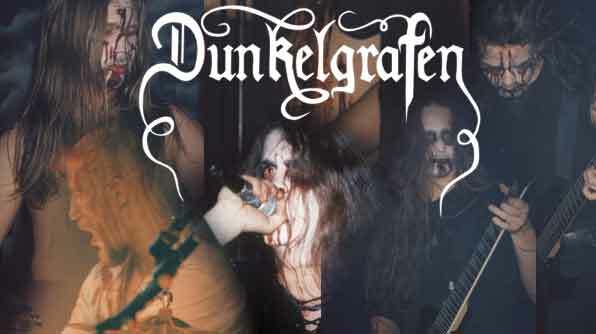 Dunkelgrafen is a german blackmetal band founded in 1995 by Dunkelgraf and Lord Asgaqlun. After finding a drummer (Gabriel) they started recording. In 1996 they were joined by Iskariot (voc./key) and Shaitan (bass). With this line-up they recorder their first demo in march 1996 at the Digan-Studio which was called, like the band, "Dunkelgrafen". In may 1996 they had their first concert with Eminenz, Impending Doom and Desaster in Koblenz. Later this year they played at the "Morbiden Festspielen" with Grogoroth, Behemoth and others. They redorded a split-single together with Eternity, called "Todesruh". In november Apokryphos joined the band, playing the 2nd guitar. In 1997 their first full-length album, called "Schatten der Ewigkeit" (Shadow of Eternity), was published. In 1998 Lord Asgaqlun left the band and Shaitan played the 2nd guitar. In may Black Force joined the band and became the new bassist. In 1999 they toured with Eminenz and Last Episode. 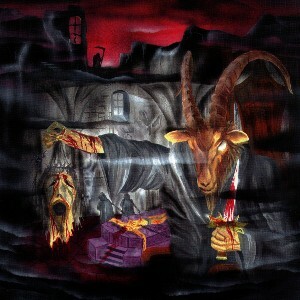 After having successfully absolved the tour, they put all their energy in recording the second album: Baphomet's Aeon at the Polygam Studios. In feburary 2000 they toured with Enthoned and Mephisotpheles and later in november they recorded their third album "Triumph des Fleisches" (Triumph of flesh) at the Erzschlag Studio. In 2001 they played at the Terorrsathan-Tour with Belphegor and with Dawn of Dreams. Later this year Iskariot and Gabriel left Dunkelgrafen and Dunkelgrad had to play the Synth in addition and the drums were put in through an electronical helper.